Many of us live in a society that constantly demands more for less. Materialism has driven a commoditization culture – an expectation that prices will fall and however much we pay is too much. Many of us understand the confrontation this has caused between buyers and sellers. Every day, we see competitive bidding destroying long-established trading relationships. We see trust and loyalty sacrificed in the name of short-term savings. In our hearts, we know that many of the ‘savings’ we achieve are illusory. The cost of a bad relationship or poor service far outweighs the extra we pay to have a good one. Yet this retail mentality persists, embedded in procurement performance metrics that encourage a short-term cost-cutting mentality. at the expense of any longer term value measurements. And so it is increasingly with Government. We are so determined to pay less tax, to have more commodities, that we forget about the value of the quality of life and society. As I look at the alienation of youth in the UK, I am forced to reflect on how we place so little value on relationships and so much on achieving ‘cheapness’. 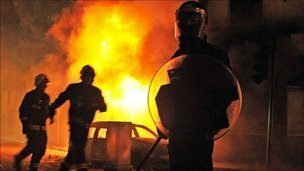 Riots are the price we pay for this fixation on ever-lower prices and the jobs and opportunities it destroys. When the UK Government wanted to eliminate ‘waste’, it brought in a retail supremo to develop procurement policy. Not surprisingly, he suggested the economics of the foodstore as a way to reduce costs. But at what longer term price to social cohesion? And as we look at the way Purchasing professionals are being trained today, they too are measured and motivated towards value destruction and the economics of Tesco or Walmart. In our quest for ‘cheap’, we have driven decisions that outsource jobs and create mass unemployment for young people. Even today, rather than build local capability (a Government policy that I admire), in practice we are forcing local government to dismiss staff and find low-cost routes to service delivery – often overseas or via automation. We then have to run expensive social programs, pay for extra policing, deal with the consequences of drug abuse to manage a generation that feels it is ignored and dismissed by the political and business leaders. Just as it was the leader into industrialization, the UK may well be the leader into the post-industrial age of social breakdown. The US appears to be not far behind. Is this the model we all wish to follow? Surely it is time to ask whether commoditization really is a good idea. Do we actually understand the cost of our current policies and practices? Just as this makes little sense for society, the same is true for business. It is time to re-think our priorities and our measurement systems. Alienation and the loss of trust is not a price worth paying for ‘cheap’ and ‘plenty’. It is really the way things are going out ther now days, we want more for less, we don’t want to pay taxes and at the same time we want all those things that are taxed, more toys more money. It is really a self doomed prophecy and we are definitely going the wrong way.